Man versus Alien in Desperate Battle. What else would you expect from a far future where there’s only war? The first version of the game came out when I was a little kid in the late 80s and this iteration is the 4th release GW has unleashed on us. It took me some time to get my hands on the game and I was actually really worried that I would never be able to buy it due to the immense interest in it from the fan base. Think about it: every time the game is released it is in limited amounts and every release has something like a 5-10 year gap in between. Naturally, when I got the newsletter e-mail I rushed to the computer to take a look and saw that the US stocks still lasted. Luckily I had some relatives traveling there who were kind enough to bring me the package (along with other goodies) and I happily ordered away. I later found out that the EU preorder was eaten up the same day, but I digress. Here’s the box in its full glory. First thing that you figure out is that the box itself is really heavy, and I’m talking several kilograms here (kinda made me wince to think I made people carry it all the way from the US to here!). It’s also made of thick cardboard and features a nice assortment of artwork across it, making it both sturdy and beautiful at the same time. The back of the box shows an example game, ‘eavy Metal painted minis and the contents. 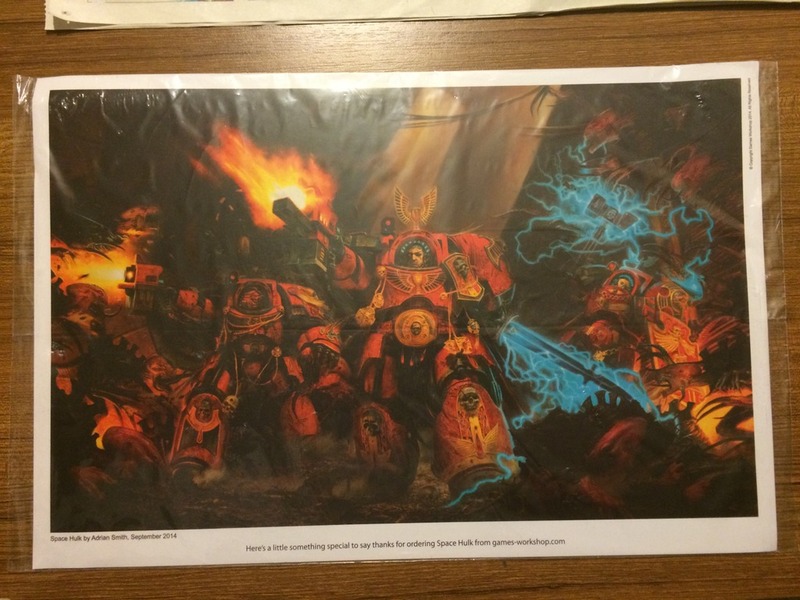 A nice idea: behind the Tyranid artwork there are Tyranid models depicted on the box. Special pieces such as objective markers and commanders. The same art trick applies to the Terminators too. A recommendation of paints for the miniatures. A full list of box contents. Now that is good packaging. The librarian and the C.A.T. unit. My camera phone really doesn’t do the figure justice: the level of detail on the face and body are amazing. 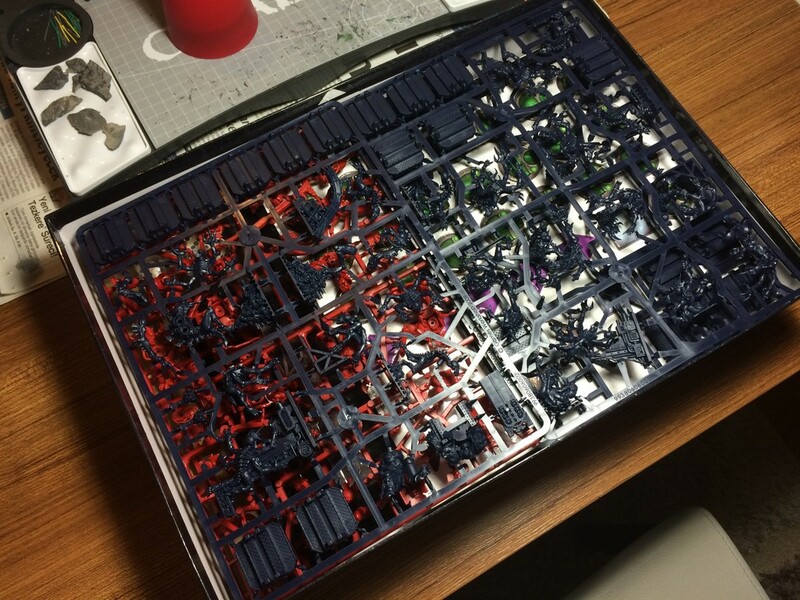 The entire sprue holds the rest of the terminators. Each terminator is comprised of no more than 4 pieces. Brother Claudio, one of my favorites. Brother Goriel, another badass from the Blood Angels chapter. Since the pieces are push-fit they’re easy to assemble for those who do not want to paint. For painters like me this means a quest to search for join lines! The Genestealers come in a wide variety of poses which is visually astounding. Just look at that. Don’t you think of Alien when you see it? More Genestealers and their Broodmother. It will be a pleasure to tackle this detail. … along with the “Dead Space Marine” objective point. Another personal favorite. Looks so much alive. 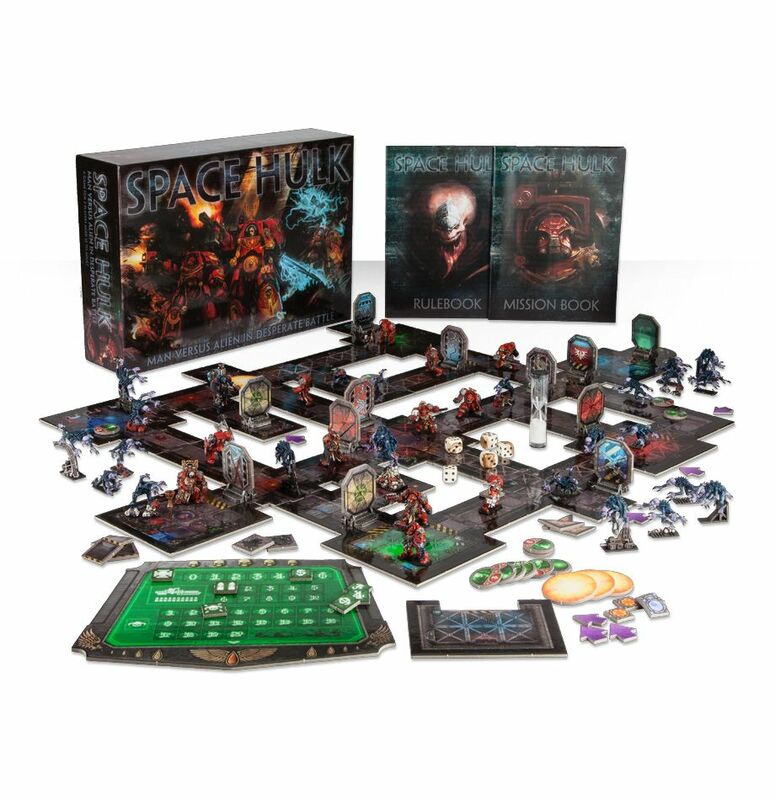 While I appreciate the idea that this is mainly a board game and the pieces are designed to be representing two teams with distinctly different colors (hence red for the Blood Angels and indigo for the Tyranids) I think those who intend on painting the minis will have a hard time with priming the models black, especially on the Genestealer front. There’s lots of detail on these fine miniatures that I would really be worried about covering using a spray primer: black on such a dark base color will be difficult to see and adjust. We’ll see how it goes, but I’m pretty sure I’ll stick to the brush for the first few test models. An hourglass for turns I think? No GW game is complete without a set of dice! Not sure what this is for but probably a cover for the markers and non-mini moving pieces. The mission book and the rulebook nicely illustrated images. From what I can see this mission is the same here and in the video game. Sweet! An introduction to the Blood Angels Terminators. The rulebook is essential to playing the game in earnest. Numerous illustrations show both amazing paint-jobs by the ‘eavy Metal team and the core of the game. 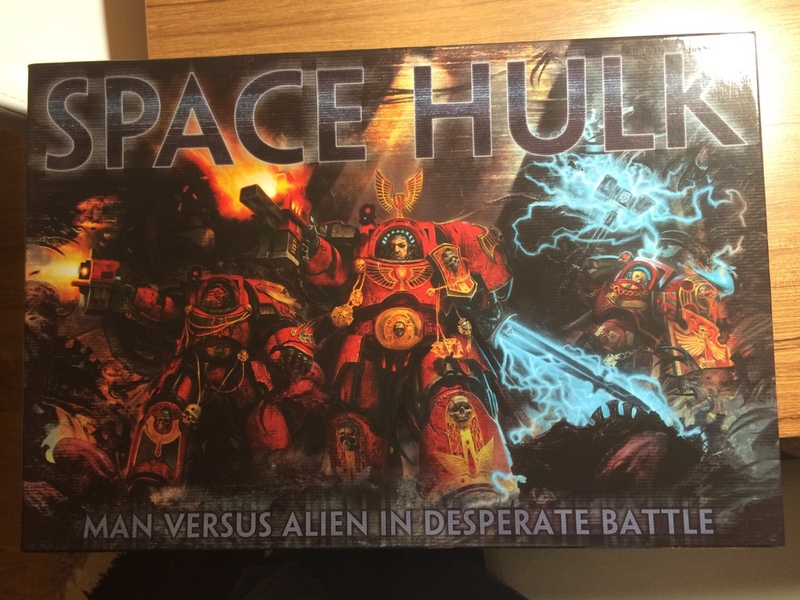 A great short introduction to the WH40k universe on the Space Marine side. Even I learned a few things on these pages. Some backstory about the Terminator figures. There are around 80 corridor and room sections as well as 20 doors in addition to the miniatures. The two booklets that come with the game provide the core of the requirements of playing the game: one rulebook that contains the “can dos” and “cannot dos” for each faction and the mission book that provides some variation and guidance for setting up the board and deploying the pieces. Rule-wise I am only familiar with the video game that was released in 2013 but looking over the mission booklet that came with the box, I think they’re either exactly the same or very similar to those in the video game. Thus I reckon the only thing for me (and other gamers out there familiar with it) is to understand the operational issues such as how the timing and the set of dice play a role. All in all aside from the coloring of the sprues I think the quality of the set is very high if not excellent and makes for both a very cool board game you can play with as well as a set of miniatures with outstanding cast quality for those mainly interested in the hobby side. Recommended to anyone who would get it with the next release, which I am informed again from the newsletters will be in December 2014. Here’s a parting shot of the bonus from GW, and thanks for dropping by! Very nice overview Roemer, thanks! I’m really psyched to get my hands on it and start playing, although I’m kinda worried that half of the playing pieces will be stuck in various stages of painting in your workshop when I come back from US 🙂 Well I should be back around New Years, which gives you only (?) 2.5 months so better get on with it! Also, what do you say we do a couple of review posts for the actual boardgaming aspect as well? I know I’m going on a bit of a tangent here, but I think miniature and boardgaming hobbies often go well hand-in-hand. Good to see you as a commenter here Xasf! 2.5 months is definitely cutting it a bit too close now that I’m working on multiple projects with deadlines, but I’ll try to have some models to play around with before you come back. At least the game board comes pre-painted! I would love to have a go at that. We could set a guest/joint post resembling a battle report. I know you have some other boardgames in the same universe so if you’re interested you can do recurring posts here too. Send me a draft you got and I’ll gladly pin it here. … and don’t you mean the False Emperor? I think a “battle report” kind of thing would go well, great idea! And yes, at the moment I have 3 more 40K games lying around: Horus Heresy, Conquest and Space Hulk: Death Angel (the card game). And I’m currently bidding on a WHFB game as well, so we’ll have plenty to go on. I might even start some previews from here and then we can do playthroughs together later on, let’s keep in touch! Grants on the snag roemer! Looking forward to your interpretation of these minis! Very cool, man. The level of detail on the models is fantastic, especially that Librarian! I assume that model will be the most difficult of all because of all the source lighting and force effects. But in the meantime it will be quite fun! Oh yeah, absolutely. He certainly has a lot of potential, I’m sure you’ll do a fantastic job on him!